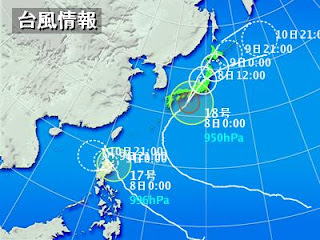 Typhoon 18 is coming up. It's supposed to be the second biggest since the end of the war, and apparently the English name is Melor?!? I went out a few hours ago and closed all the storm shutters, but the wind is really raging; quite a terrific noise! Since we don't have to worry much about flooding or tsunami here in Sanda I'm just enjoying the wild sound of the wind.